Democrats in Delaware have resuscitated a legislation plan that would declare sheriffs in the state have no power to make arrests after a GOP proposal on the dispute was abruptly withdrawn by sponsors. Unlike police chiefs, who are hired by government officials, sheriffs are elected by the people and historically have been recognized as a highest-ranking law enforcement officer in a county. The initial legislation, HB 290, was proposed at the behest of Sussex County officials who took issue with their sheriff, Jeff Christopher, who is attempting to restore the office to its constitutional role. The bill would have redefined the role of sheriffs to where they can serve papers and process administrative work but have no hand in actual law enforcement. 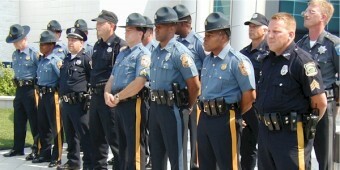 Supporters of the legislation said law enforcement authority belongs in the hands of the state police and city police. Five days after WND first reported on the issue, Rep. Danny Short, a Republican sponsoring the bill, announced he was striking the bill from further consideration, saying it was being hijacked for political purposes. According to Short, prior to passing the bill, the legislature was planning to draft a concurrent resolution asking the Delaware Supreme Court to issue a ruling as to whether sheriff’s and their deputies have arrest authority under the state constitution. However, prior to the resolution being submitted, the bill was placed on the House Administration Committee’s agenda, without his request. Short then tabled the bill, effectively killing it. However, House Democrats quickly crafted a proposal to resurrect the bill. Riven’s e-mail provided “talking points” for Democratic legislators and admitted the purpose for the legislation was a direct result of Christopher’s actions. One of the talking points for saying sheriffs do not have arrest authority is because other state officials such as Attorney General Beau Biden, son of Vice-President Joe Biden, are also listed in the state constitution as “conservators of the peace,” but they do not have the ability to arrest. However, when WND contacted Rivin about obtaining a contact number for the call, she said members of the press were not permitted to attend the meeting. While it is unclear what was discussed at the meeting, on May 3 Schwartzkopf introduced HB 325, which is virtually identical to HB 290, in an apparent attempt to get around Short’s tabling of his bill. Under both bills, the sheriff and his deputies would be stripped of all authority to enforce any laws including traffic stops. While legislators say it is not their intention to eliminate the sheriff’s office, it is difficult to reconcile that when considering who the bill does give arrest power to. Under the definition of law enforcement officers it includes the fire marshal and even “dog catchers,” however sheriffs are not even allowed to enforce dog control laws and ordinances in their counties. State forest officers even have the ability to arrest anyone who is “committing or about to commit an offense against any of the laws enacted for the protection of forest, brush, grass or wild lands in this state” but the sheriff does not. While this may appear to be simply a turf war, there is one section of the bill that could have life or death consequences. While the section went on to say sheriffs did not have any arrest authority in these situations, they were at least permitted to participate in helping locate the child. However, under Schwartzkopf’s bill the word sheriff is stricken from the same section, meaning they are not allowed to assist or investigate in any way even if to do so could save a child’s life. WND attempts to contact Schwartzkopf for information about the bill were not returned. Delaware officials have attempted to claim that the sheriff has never had arrest authority in the state. The problem with these statements is that in Delaware the office predates the founding of America by nearly 100 years. The state’s first sheriff took office in 1669. Faced with this dilemma, Schwartzkopf has attempted to walk back statements that the sheriff has never had arrest powers. Wolf von Baumgart, state chairman for the Independent Party of Delaware sent an e-mail to Schwartzkopf asking him what was the legal, statutory and constitutional basis for determining that sheriffs do not have arrest powers. Christopher said he suspects that Schwartzkopf has been one of the key figures behind the entire legislative process to strip the sheriff’s office of their constitutional power. Christopher said if the sheriffs lose their arrest ability then Delaware will be a de facto police state.